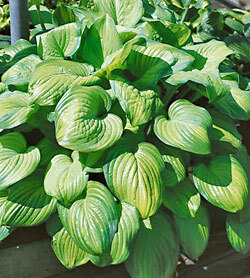 This excellent seiboldiana hosta boasts huge, nicely shaped avocado-green leaves edged in a darker green. The coloring suggests a halved avocado and thus inspires its name. Guacamole grows rapidly into a 3-foot wide and 2-foot wide plant with great foliage color and sprays of fragrant lavender flowers in late summer that hummingbirds find irresistible. Order today and treat garden guests to a little Guacamole.